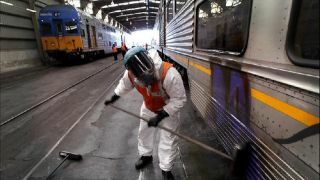 Sydney trains are being fitted with chemical sensors that will be able to detect when passengers are sprawling graffiti across the cabin, following a successful trial over the past 12 months. Fumes from aerosol spray-paints or permanent markers will trip the sensors, activating a live stream of video footage funnelled straight to Sydney Trains and Police Transport Command. With the trap sprung, law enforcement will then be able to catch vandals in the act. According to Fairfax, over 30 people have been caught in the act using the anti-graffiti tech that the NSW state government has dubbed 'mousetrap'. For obvious reasons, the details concerning the number of trains that will be fitted with Mousetrap devices is not being divulged, but the initial outlay for the system is around $500,000. Sydney Trains chief executive told Fairfax that the chemical sensors were portable and concealed, so it was possible for the device to be used in a number of locations. The successful trial of the program, which began a year ago, was initiated in to reduce the $34 million dollars spent on graffiti removal last year.